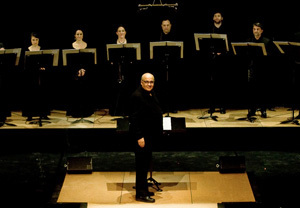 Rachid Safir had a dream: to create an ensemble capable of covering the whole repertoire of vocal polyphony from the Renaissance up to the present. This dream became reality in 1988, when he created les Solistes XXI, a group made up of professional singers of different stylistic sensibilities. The number of singers varies from four to twenty, and they are occasionally joined by instrumentalists for particular repertoires. The "one per voice" principle allows for precise, modelled interpretations. - the confrontation of works from different periods, thereby enhancing each other. - the group of soloists which permits great freedom of individual expression, but also requires very precise listening work, therefore a lasting collaboration both with and between singers as well as with the composers. The press and numerous composers who have written for les jeunes solistes are unanimous in praising the excellence of this group, a precious instrument in the service of vocal art. The les Solistes XXI ensemble is subsidised by the department for cultural affairs of the Ile de France region and the Ministry of Culture and Communication and by the Mairie de Paris. It is a member of FEVIS (Federation of Specialised Vocal and Instrumental Ensembles).